German radical Rudolf Rocker was one of the most prominent figures of the anarcho-syndicalist movement during the classical period. His works such as Nationalism and Culture (as well as works of literary criticism like The Six) also made him anarcho-syndicalism’s most noted intellectual in the Anglophone world. A polyglot, Rocker learned Yiddish and became a well-known organizer of Jewish workers when he lived in London. Lesser known is Rocker’s work as a translator, and his most interesting work was a Yiddish translation of Friedrich Nietzsche’s Thus Spoke Zarathustra. 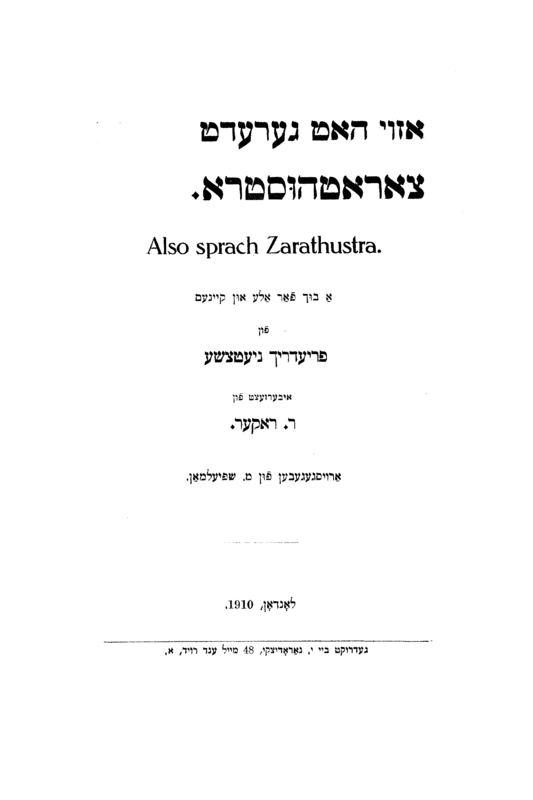 The Yiddish edition can be read online here. Some of his Rocker’s works in Yiddish are available here as well. The proposal to combine Nietzsche and anarchism must sound audacious to many people. Even if one doesn’t hold to the old belief that the “working class” (whoever that might be today) are the only ones who can make revolutionary change, wasn’t Nietzsche an influence on the fascists, and an individualist who championed the right of the strong to rule over the weak? And doesn’t Nietzsche himself repeatedly denounce the anarchist movement of his day, calling them “dogs” and accusing them of ressentiment? Without consulting Nietzsche’s works themselves in an attempt to “prove” or “disprove” whether he is compatible with anarchism or not, I believe that a more fruitful way to approach this proposed conjunction is to look at the historical record of how left-wing anarchists have approached Nietzsche. The surprising answer is that many of them quite liked him, including the “classical anarchists”; in fact, some of them even used his ideas to justify anarchist beliefs about class struggle. The list is not limited to culturally-oriented anarchists such as Emma Goldman, who gave dozens of lectures about Nietzsche and baptized him as an honorary anarchist. Pro-Nietzschean anarchists also include prominent Spanish CNT–FAI members in the 1930s such as Salvador Seguí and anarcha-feminist Federica Montseny; anarcho-syndicalist militants like Rudolf Rocker; and even the younger Murray Bookchin, who cited Nietzsche’s conception of the “transvaluation of values” in support of the Spanish anarchist project. There were many things that drew anarchists to Nietzsche: his hatred of the state; his disgust for the mindless social behavior of “herds”; his (almost pathological) anti-Christianity; his distrust of the effect of both the market and the State on cultural production; his desire for an “overman” — that is, for a new human who was to be neither master nor slave; his praise of the ecstatic and creative self, with the artist as his prototype, who could say, “Yes” to the self-creation of a new world on the basis of nothing; and his forwarding of the “transvaluation of values” as source of change, as opposed to a Marxist conception of class struggle and the dialectic of a linear history. The heresy of the Free Spirit therefore demands a place in any survey of revolutionary eschatology – and that is still true even though its adherents were not social revolutionaries and did not find their followers amongst the turbulent masses of the urban poor. They were in face gnostics intent on their own individual salvation; but the gnosis at which they arrived was a quasi-mystical anarchism – an affirmation of freedom so reckless and unqualified that it amounted to a total denial of every kind of restraint and limitation. These people could be regarded as remote precursors of Bakunin and of Nietzsche – or rather of that bohemian intelligentsia which during the last half-century has been living from ideas once expressed by Bakunin and Nietzsche in their wilder moments. But extreme individualists of that kind can easily turn into social revolutionaries – and effective ones at that – if a potentially revolutionary situation arises. Nietzsche’s Superman, in however vulgarized a form, certainly obsessed the imagination of many of the ‘armed bohemians’ who made the National Socialist revolution; and many a present-day exponent of world revolution owes more to Bakunin than to Marx. In the later Middle Ages it was the adepts of the Free Spirit who conserved, as part of their creed of total emancipation, the only thoroughly revolutionary doctrine that existed. And it was from their midst that doctrinaires emerged to inspire the most ambitious essay in total social revolution which medieval Europe was ever to witness. Norman Cohn, The Pursuit of the Millennium: Revolutionary Millenarians and Mystical Anarchists of the Middle Ages, Revised and Expanded Edition (NY: Oxford University Press, 1951/1970), pp 148–49. 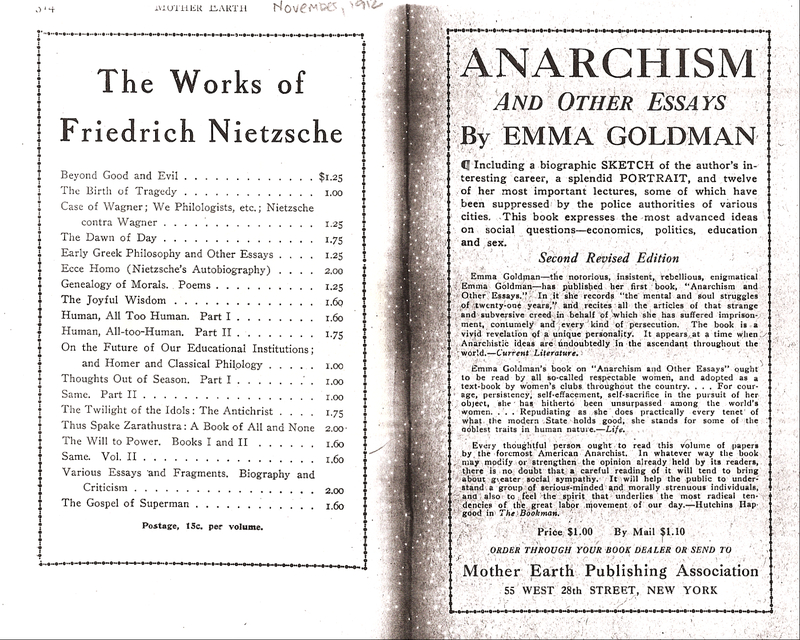 Below is an ad from Emma Goldman’s journal Mother Earth, advertising the collected works of Frederich Nietzsche, which could be ordered directly through the magazine. This ad originally appeared in the November 1912 issue, and the magazine offered Nietzsche’s works for sale through 1914.